Along the Marginal Way in Ogunquit, Maine, there are so many beautiful vistas of the sea. 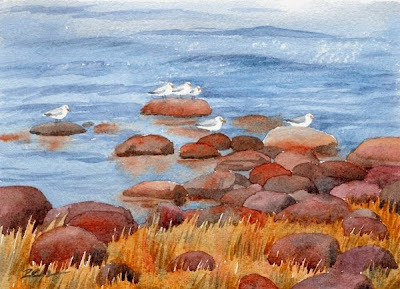 I loved this scene of seagulls resting on some of the many rocks along the coast. The grasses have turned golden and the sun sparkles on the water in this autumn painting. The original watercolor is sold, but I can paint one just for you or make a print at the size you like. Contact me to order. What a lovely sketch! Bright, colourful and sparkling. Very nice. Love this scene especially with the gulls. Growing up on the Coast of Ga. seabirds were my favorite. Thanks Maree and Struggling Artist! I like the scene too. Actually, the gulls were very cooperative to line up almost just like that making a great composition. They gave me the idea for the painting.